Continuous flash suppression is a powerful technique to render stimuli invisible for longer periods of time. 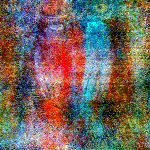 One eye is presented with the target image and the other eye with Mondrian masks that change at a frequency of ~10 Hz. This simple setup renders the target image invisible! Check out the example on the left with red-blue goggles and see Germany's former president Wulff disappear (and reappear)! You can download the masks here. Phase scrambling is typically used to retain the low-level image properties of images, but to make the content of the image less visible. This can serve as a baseline condition for localizers of object-selective brain regions. It can also be used in experiments where the visibility of stimuli is reduced. Here, the Matlab image Mandrill is partially phase scrambled. The code is found here. Using a similar approach, nice clouds can be created. These clouds can serve as a basis for the Anderson & Winaver illusion. 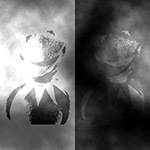 Here, both Kermits have the same luminance, but they look completely different. The code for making clouds and such illusions is found here.